I usually watch the remembrance ceremony on TV, in such a disconnected way. Usually flipping between the Ottawa and Vancouver telecasts. I should say disconnected, but there is always something that stirs in me, brings the tears to my eyes. 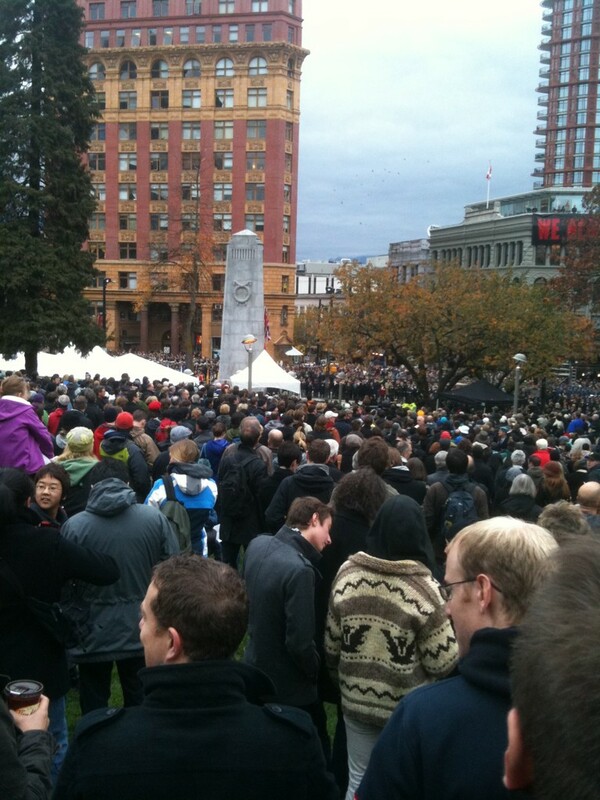 Last year, we moved and now we are only a couple blocks from the Victory Square cenotaph. Alas last year I watched it on TV, lazy me. But this morning I felt I should go join the others gathered at the Victory Square cenotaph. I went down there and joined the crowd. It was such a great connection there in the midst of the crowd and it was chilly, but the rain held off and everyone with their friends, children quietly listening to the speeches, to the choirs, the bagpipes. My emotions were swirling standing in the midst of so many people. Had a bit of a struggle to keep from weeping openly, damn these sentimental emotions of mine. Then at the eleventh hour a singular trumpet “Last Post” played, accompanied by a fly over of military and civilian aircraft, and the booming of the 21 gun salute. It was as the drone of the aircraft faded a lone train horn, I assume from the train station at main street, broke the silence and echoed through the buildings around us. In this moment I looked around and saw the many tears. Indeed it’s such a noble thing to share with a great many people a singular note of emotion.